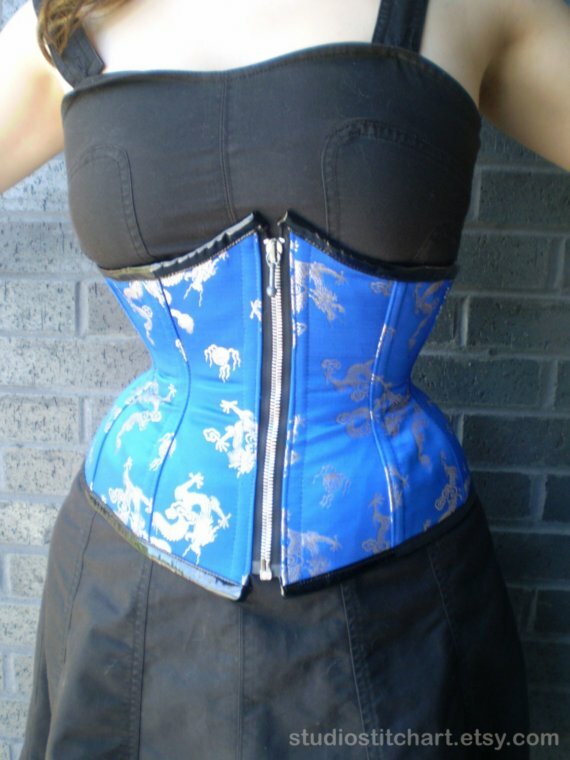 -for speedier replies please add style # of corset you are interested in and fabric you have in mind. Replies will be within 24 - 48 hours. -If you have a fabric you would like me to use please bare in mind it will need to be a good sturdy fabric i will need to see and approve it. I want you to get the best use and quality in your corset and fabric plays a big part in that. Listed below are a few categories of corsets and the price average. They do not include shipping if these are to be shipped. Also known as a cincher or a cadet riding corset. Sits right under the bust. Front busk opening back lacing. Spiral steel and flat steel boning., 8" busk, grommets. Coutil lining. This corset covers the bust and hugs you waist and high hip curve. Front busk opening, back lacing. Spiral steel and flat steel boning., 12" busk, grommets. Coutil lining. Halter straps can also be added. Also possible with halter strap. Good quality Jacquard ribbon in a pretty pattern is difficult to come by and price range varies working on looking for a good supplier so I can carry a few colors and patterns. This is my version of a "light" summer corset. It's less rigid than a victorian corset as I use a soft cotton/linen blend for the lining. It still gives a lovely waist shape and bust hold because i still use the awesome boning from the victorian corsets. The outside is a printed cotton fabric available in various prints and colors. can be worn with a cute cotton skirt or even a pair of jeans. I also have the option of having the boning be removable for gentle hand washing. Back grommet lacing spiral stele boning and flat steel boning. *removable boning: this is achieved with a tiny snap at the top of the boning channel you just open up and pull the boning out. bones are numbered so you know where to put them back. This corset was also refered to as the "Gibson girl" look from the early 1900's. The shaping gives for an "S" curve emphasizing the back hip posterior area. The lacing is decorative but fully functional and can be emphasized with contrast lacing. Front busk opening, back lacing. Spiral steel and flat steel boning., 12" busk, grommets. Coutil lining.